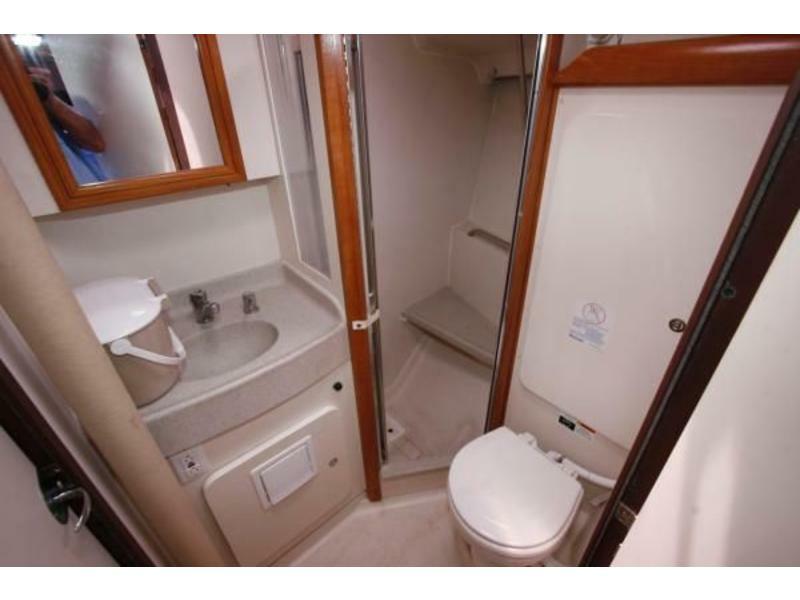 The CATALINA 350 allows enough privacy for two couple with staterooms both fore and aft with privacy doors. 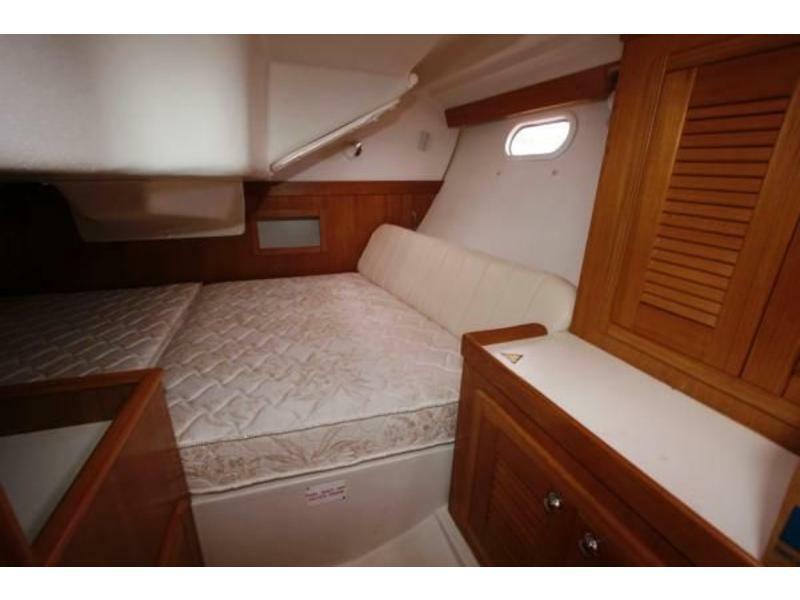 The Master Stateroom is forward and has a Queen Centerline Bed and drawers and dresser. 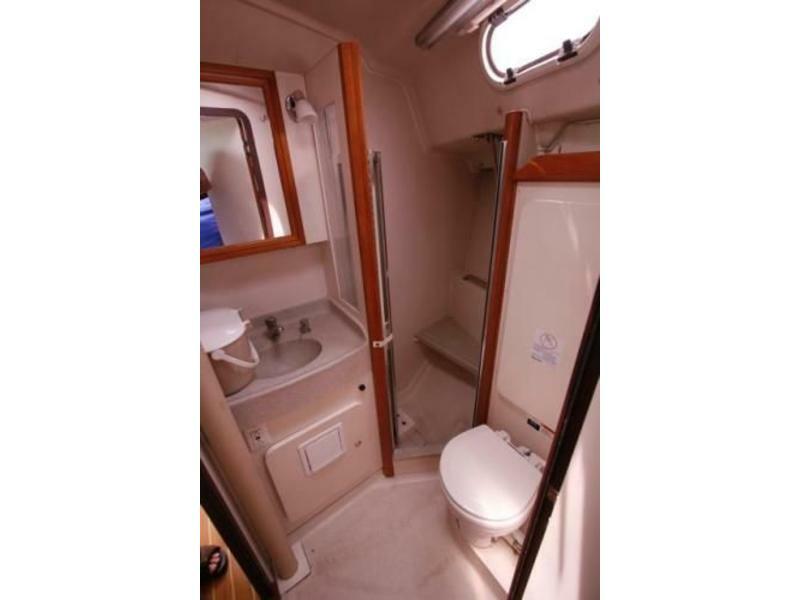 The Aft Cabin comfortably sleeps 2 and also has plenty of storage for clothes and personal belongings. 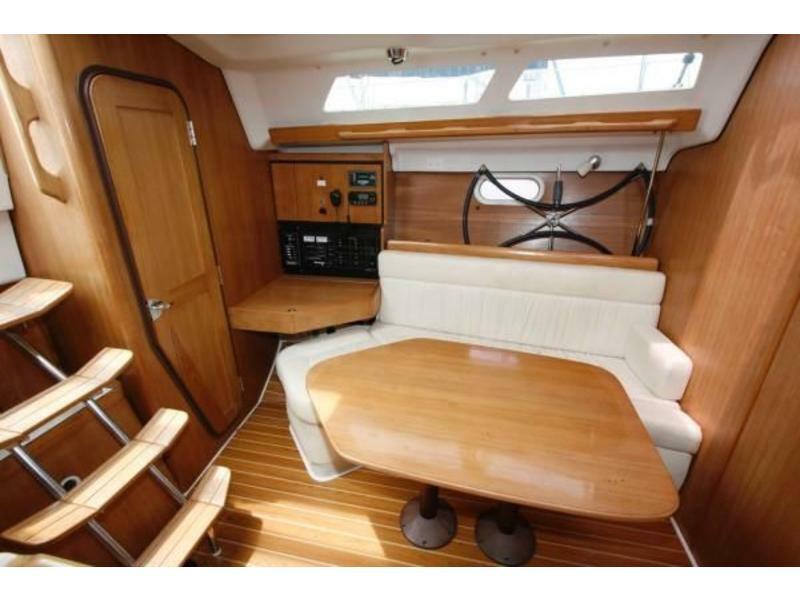 The starboard section of the salon has a small table that coverts to a settee which can become a sleeping quarter for one person. 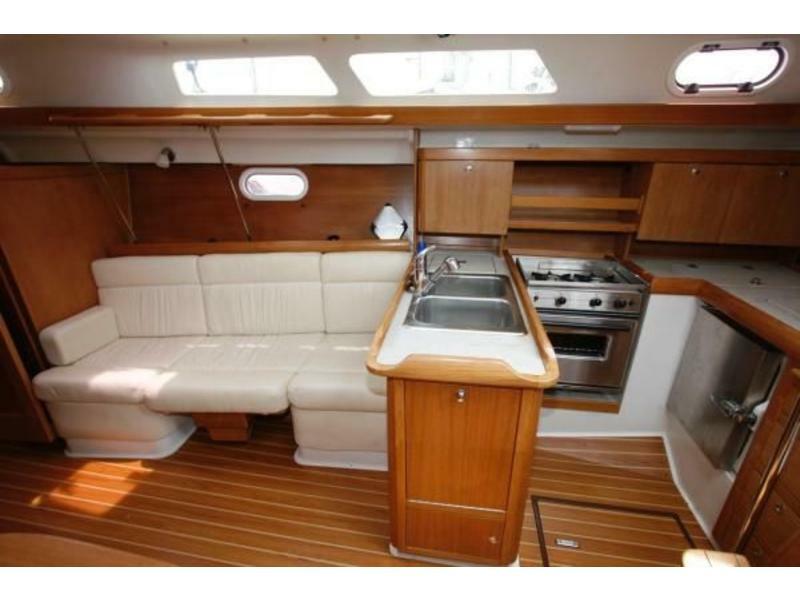 To port is a nicely finished teak dinette table that can drop down and create additional sleeping quarters for two. There’s also a smaller cocktail table that can be substituted for the dinette. 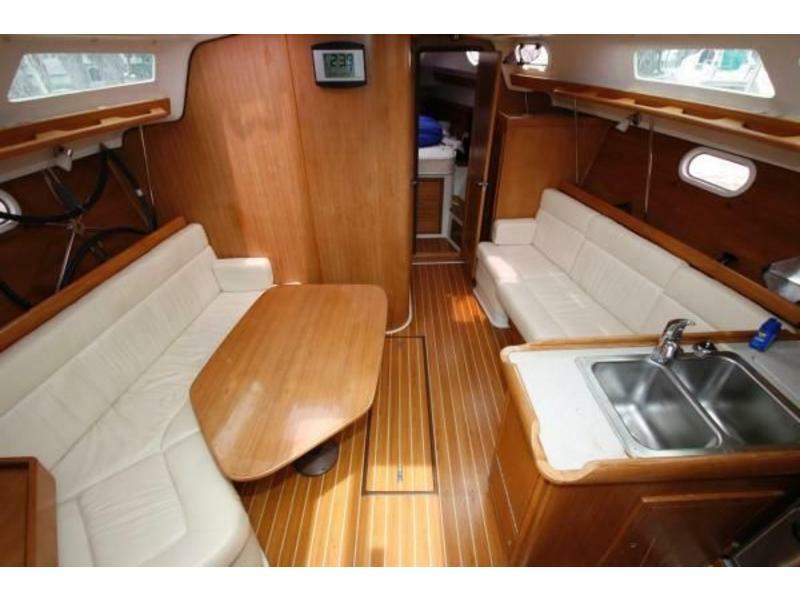 The upholstery is Ultra Leather in Oyster White and in excellent condition. 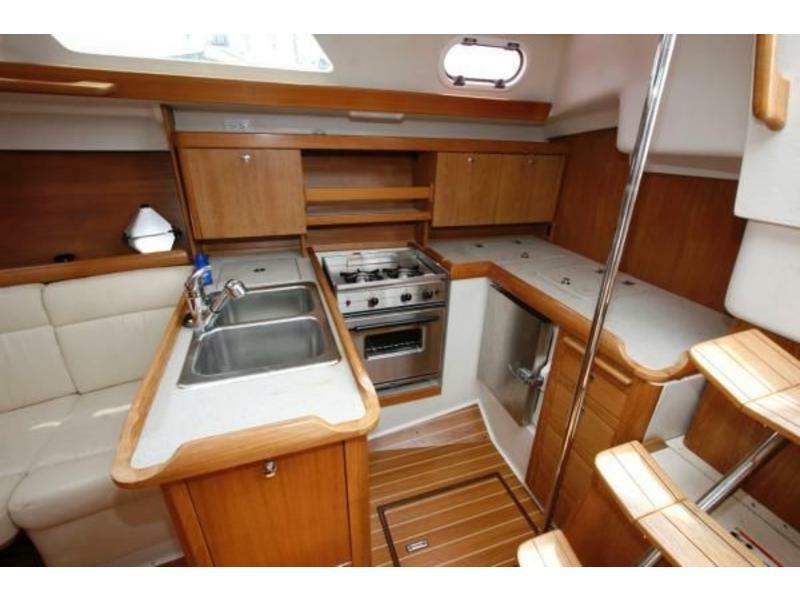 The large counter spaced galley is U-shaped and has a separate freezer and fridge with top and side access. There’s plenty of storage for pots’n pan, food, etc.. 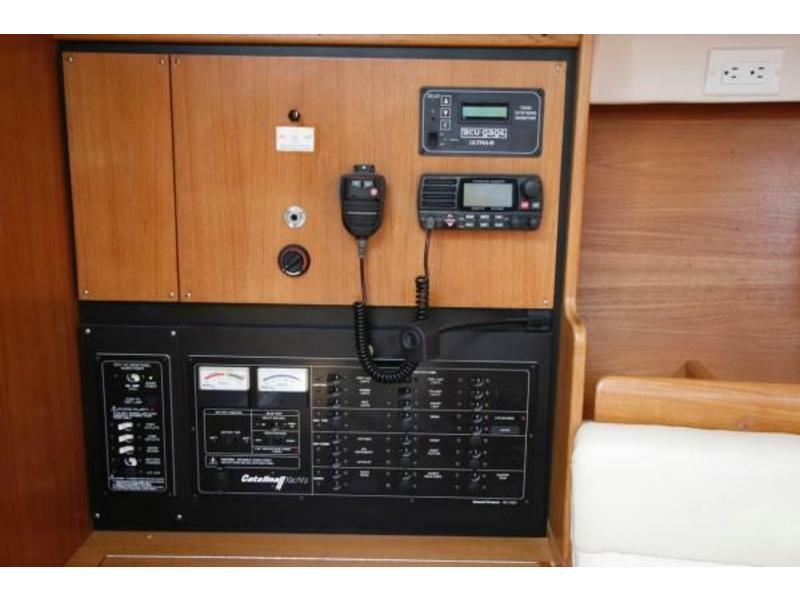 The Nav Station is across from the galley and to port. The cabin sole is a composite simulated teak ‘n holly and is more durable compared to a real wood floor. 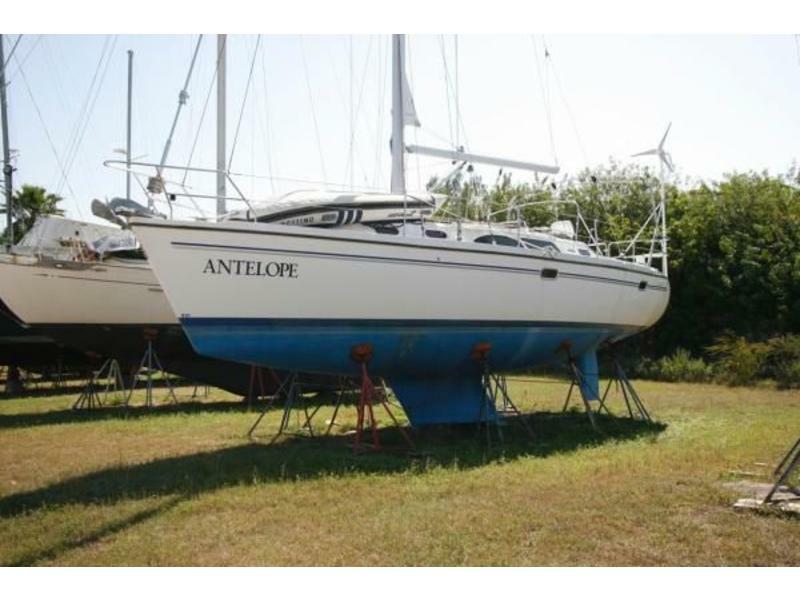 The Catalina 350 is CE-A rated fro unlimited offshore and meets all the voluntary ABYC yacht building standards. Wide decks and inboard shrouds make for secure movement fore & aft as well as tighter sheeting angles. 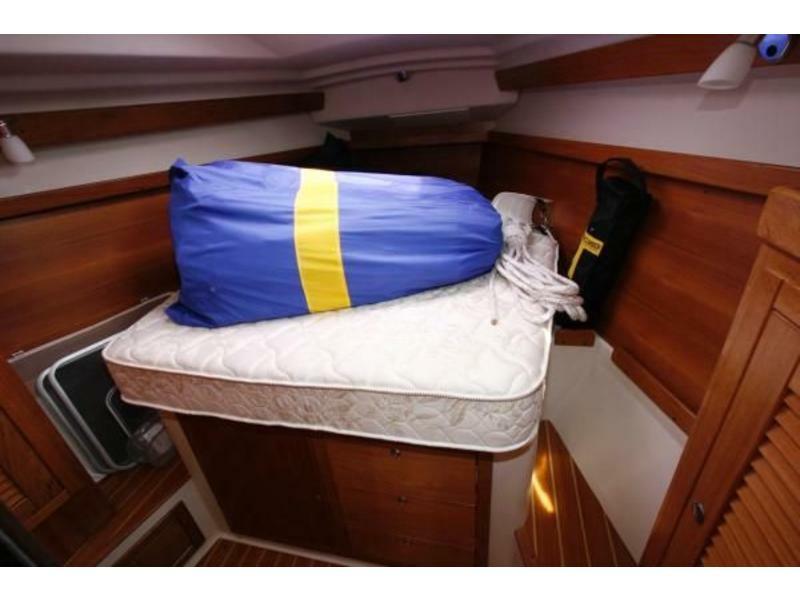 A recessed anchor locker, double rollers and elctric anchor windlass make anchoring a breeze. 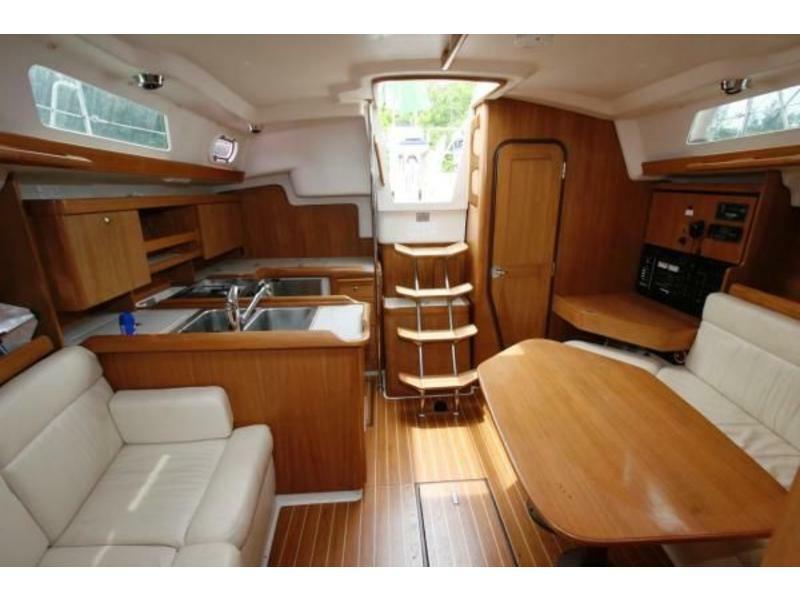 The CATALINA 350 is comparable to many 37 footers with her overall length of 36.5″ and beam of 13′. 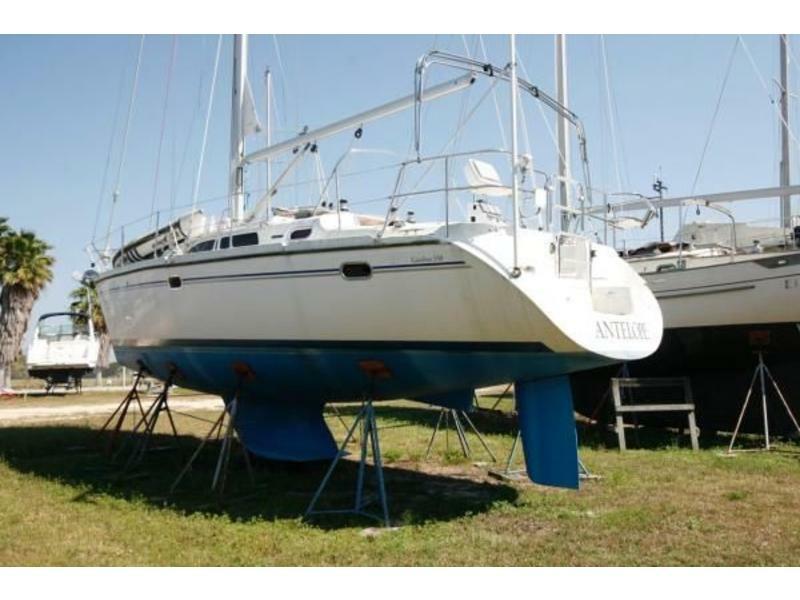 The Catalina 350 utilizes Charleston Spars with a double spreader mast stepped on a compression post, with in -mast furling and furling headsail. 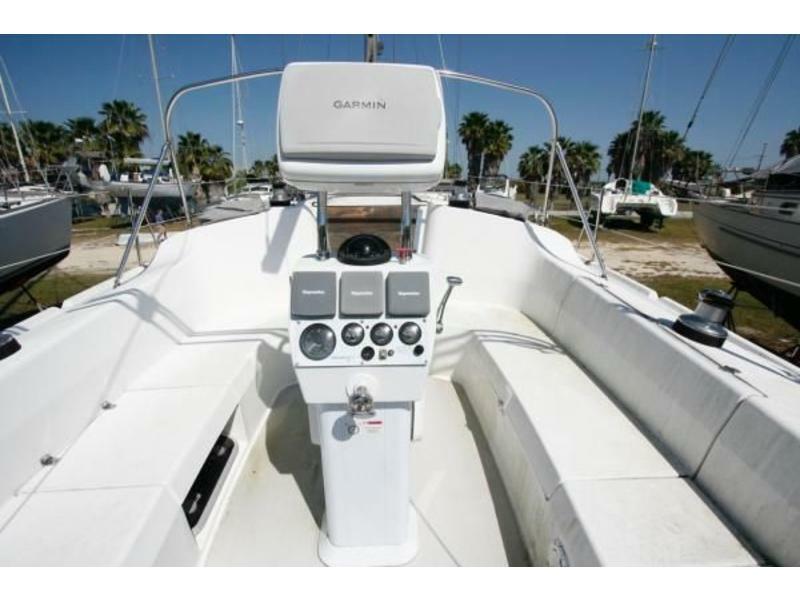 All lines are led to the cockpit for safe and convenient sail control.